 44 Gift Ideas for the Impossible Person & Entrepreneurs! Drag and Drop Table for 1 vs 1 comparisons added further down this page. Click here to jump to the Quick Compare Great option for  phone users. Click here to jump to the Quick Compare It will save you time comparing. Uptime & Server Response Time info: NEW!! Monitored Dates (of IPs and known sites of provider) Oct 19, 2016 – Nov 18, 2016 via UptimeRobot. Server Response Times US (W=West Coast) US (E=East Coast) via BitCatcha. Free domain info: Some of these hosts only provide a free domain with an annual plan. Host Gator Migration Info: A limited number of free transfers from other hosting providers, or inter-server transfers between HostGator servers for new accounts within 30 days of signup. Money Back Guarantee Info: Free domain registrations will not be able to be refunded if you choose to take the money back guarantee. So the value that the host assigns to the domain registration will be deducted from your refund. This amount usually ranges $7-$15. Liquid Web recently acquired WiredTree which was an awesome host. Liquid Web has been an absolute nightmare. The migration took over a month and was a huge cluster @#&*. With any competent host a migration will take a single day and propagation lasts 72 hours. Their Heroic Support is anything but heroic! I’ve been on hold over 20 minutes and just hung up. I’ve had tickets sitting in their ticket system for 2 days that go completely ignored. STAY AWAY FROM LIQUID WEB. If your site goes down they simply do not care like they use to in the past. I started using a new service to measure uptime and a separate service for server response times. I’m very happy with them as their accuracy is alot better. Uptime really hasn’t changed much for all of them. Although in between the last monitored dates (Nov 27, 2015 – Dec 28, 2015) it has given Arvixe a chance to improve their crap performance (92.37% uptime). Which I would still consider crappy (currently 99.52% uptime via new dates of Oct 19, 2016 – Nov 18, 2016). Which is a fantastic improvement but still not up to the acceptable standard rate of 99.9% uptime. Liquid Web uptime improved from 99.84% to 99.99%. The best balanced server response times across the United States are for the hosts: Host Winds, Hostgator, Dreamhost and Arvixe. This is milliseconds we are talking about though, so there is not much of a difference. With the new service (BitCatcha) I’m able to monitor the server response times from multiple points around the globe. Although in this chart I only report the United States East Coast and West Coast. I may update the chart again soon to include all the global points. Until then I plan to release the web hosting comparison charts for Europe & UK based web hosting companies and India. PS Remember the Drag & Drop Table at the bottom can be used to compare hosts 1 vs 1. PSS I’ll update the written part below the Drag and Drop Table soon. Hostmonster stays at the top with InMotion being added to the web hosting comparison chart as of 1/28/2016. Hostmonster offers more unlimited of everything and still during the Dec 26, 2015 – Jan 24, 2016 monitoring period still reports a 100% uptime of the 6389(now increased) known IPs. %99.9 uptime reported for InMotion are perfectly acceptable numbers in the web hosting industry and they server response time is the fastest on the entire chart. 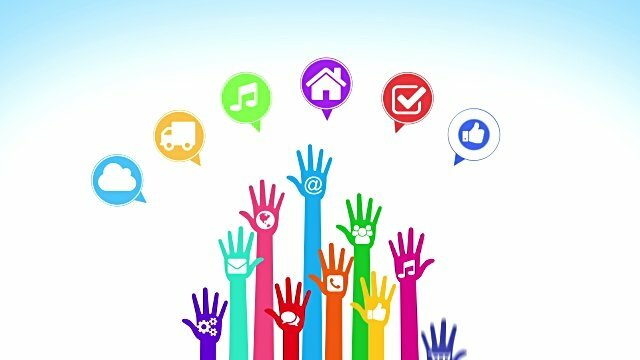 InMotion offers many educational resources and does a very good job of responding to support across all of their platforms indicating that they are very beginner-friendly and aim to please. With all this said it really comes down to your needs? If you want to build and manage many sites then Hostmonster has the base all-inclusive package for you. If you want blazing fast speed and just a few sites then go with InMotion. You could get more sites in the Power plan for $1.40 extra a month but as I have said before this chart is based on all the entry level hosting packages so the baseline has to be set somewhere. 2 websites per account, $250 in advertising credits, far more known IPs to justify a correct uptime and a faster server response time of 141ms compared to that of 272ms from Hostwinds, makes InMotion pull ahead. If you don’t need a Windows server then you get everything you need from Hostmonster. Unlimited sites on 1 account vs Hostwinds 1 website per account is a great option to have in case you want to start up multiple sites. The $200 advertising bonus will help to get you a little bit of traffic to. Hostwinds server response time does report at a faster speed for the dates mentioned but there is not as much information available on them when it comes to reporting a guaranteed uptime like there is with Hostmonster. Based on 5120 known IPs hosted with Hostmonster there were 3 reported outages during the time range. Hostwinds is only a few years old (around 7 years now) so that makes them the new kid on the block. They still have to prove themselves but they have been bringing it from the very beginning. Free migration, server response time, unlimited disk space and unlimited emails. All of these features are the major areas that put them ahead of Bluehost. Despite other hosts offering more in several areas than Liquid Web they would have been Number 1 on this list if it wasn’t for the 99.84% uptime. 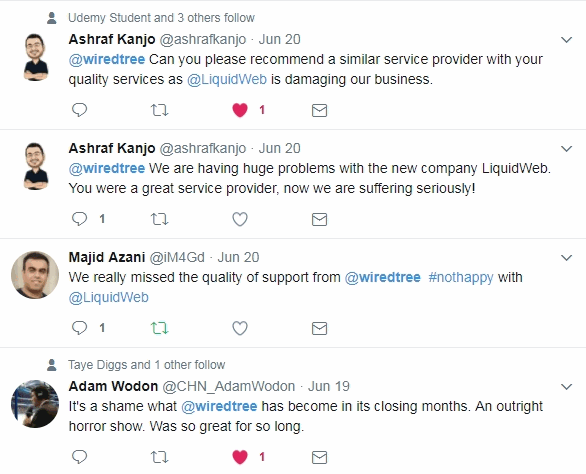 Their Heroic Support staff really goes above and beyond to help solve your issues and simply help you out UPDATE6/30/2017 Liquid Web recently acquired WiredTree which was an awesome host. Liquid Web has been an absolutely f’ing nightmare. The migration took over a month and was a huge cluster &$@#. With any competent host a migration will take a single day and propagation lasts 72 hours. Their Heroic Support is anything but! I’ve been on hold over 20 minutes and just hung up. I’ve had tickets sitting in their ticket system for 2 days that go completely ignored. STAY AWAY FROM LIQUID WEB. If your site goes down they simply do not care like they use to in the past. I had them hosting(dedicated hosting) a heavily trafficked multimedia entertainment site of mine for 2 years and their support never failed to solve any issue I brought to them immediately. One time I just wanted them to install a server-side caching app I couldn’t figure out how to install so I asked them to do and they did free of charge, then told me it was cool it was pretty simple haha. Over the 2 years I believe I had about 4 or 5 outages with them that usually didn’t last 30 minutes because of their monitoring software I’m sure. If they would get that uptime in better shape they would be awesome because their servers are so fast it is mind blowing. Bluehost does out-compete Liquid Web though simply because during the monitored dates they managed to keep nearly 100% uptime for 23485 known IPs only 13 reported outages. Bluehost also offers more disk space, a great price and their speed is really good. Support is the only reason that Liquid Web is ranked above Hostgator here. Hostgator use to have excellent support but it seems like many customers have been posting more and more lately about how their support has gone down the tubes over the past years. 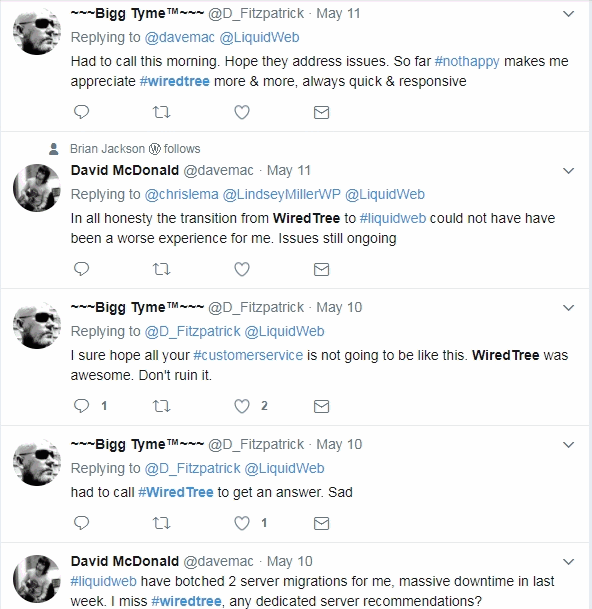 Everyone has their opinions and I’m sure Hostgator’s support team is atleast trained to deal with the most common issues so if find you comfort in that go with them, but if you want really good support that will hold your hand, then go with Liquid Web. 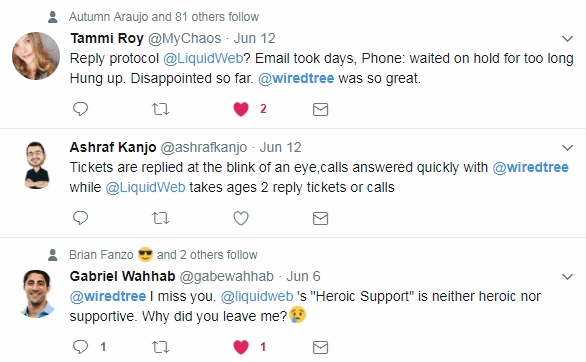 Anyone could easily have better support than Liquid Web. If Siteground reported a faster server response time then they would easily be Number 2. But they didn’t, so Hostgator beats them with more disk space and server response time speed. Siteground beats out iPage by offering free migration and a better uptime. iPage does offer unlimited disk space and websites on one account but not offering cPanel is a huge downer. iPage is also rebuilding their customer satisfaction based on the reviews I have read whereas Siteground doesn’t have much of an issue in that area. iPage offers more unlimited in several areas than Godaddy does, along with better performance. Despite Godaddy not offering as much as Dreamhost atleast they do not charge extra for 24/7 phone support. Godaddy’s support is also pretty good, especially on the common issues. Dreamhost reported better performance. Although Dreamhost has some nightmarish customer complaints it seems to be nothing compared to the problems people report that they have with 1&1. I guess you really do get what you pay for in this case. Arvixe has really dropped the ball on this one because they would have been several ranks higher if they simply managed to keep their clients website online.. you know, what they are paid to do. A 92.37% uptime is beyond unacceptable and inexcusable. Do you have an opinion on any of these hosts? Also if you have any questions about anything that isn’t in the comparison chart then let me know by leaving a comment. Now stop reading this stuff, pick a host and build your site! Here's the short story: I've built a network of websites receiving millions of visitors a month. All without any Social Media Marketing. Now I'm building a blog, learning SMM, and sharing it all along the way. Do Not Dwell may receive a commission, fee and/or other compensation at no additional cost to you on some clicks or purchases made on, through or linked from the service. this means Do Not Dwell may receive some form of compensation through an arrangement it has with a third party if you (i) click on certain ads or links on our websites, emails or newsletters, or (ii) purchase a product or service after clicking a link.